I recently went to Michael's to get some things for knitting and while I was there I noticed their extensive ribbon collection! What was weird though, was the extensive LACK of wrapping paper. They had maybe 3 solids, but fortunately one was gold, which is always fun to paint. Ohhhh Carol! Love this. I adore how you painted that gorgeous ribbon. 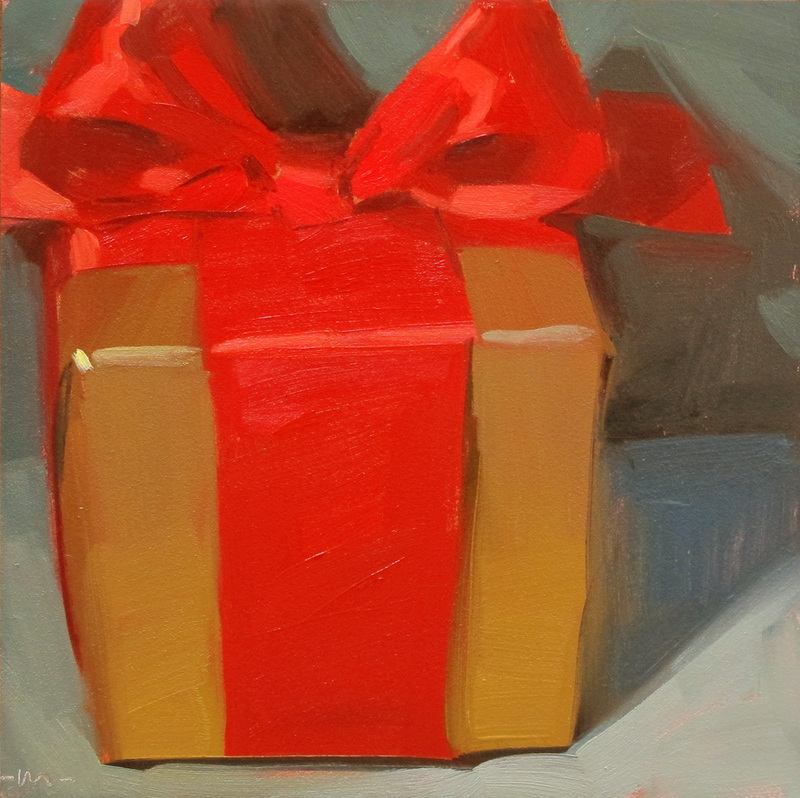 I just discovered painting gift boxes and had such fun with everything about them! I love that little shadow beside the ribbon on the front. Love the big shadow from the box. Never too Early for Christmas! Merry Merry!! I truly enjoy your updates. It makes my day! I love the little box, your right, too early for Christmas. But it is certainly ready for the big day. Do you remember the gold package with the red bow that I brought to your workshop in LA in Dec. 2010? You painted it beautifully, and I wanted it badly. However, my name wasn't drawn for it and another lady took it home. She called me a few days later and asked me if I wanted to buy it from her. I said, "Yes", and the painting now graces the wall of my studio. You and Kathy Cousart can really paint bows. 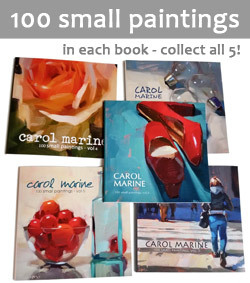 I treasure my two Carol Marine originals. Carol, I think one major reason your paintings are so terrific is that you have FUN painting them. This is one of my favorites because like all your work it has personality. The little curve in the ribbon on the left is my favorite. This is great Carol! Like Fay said...it looks like you had so much fun painting it! On the Christmas front...it is too early! It is hard to believe that we will be approaching it in about 2 months! This year has gone by way too fast! Oh wow, you knit too?? Heard you today on AHA and felt compelled to see your work in more detail. You really know how to capture the essence of your subject. Someday I'll take a workshop from you and then we can talk about knitting during the breaks!